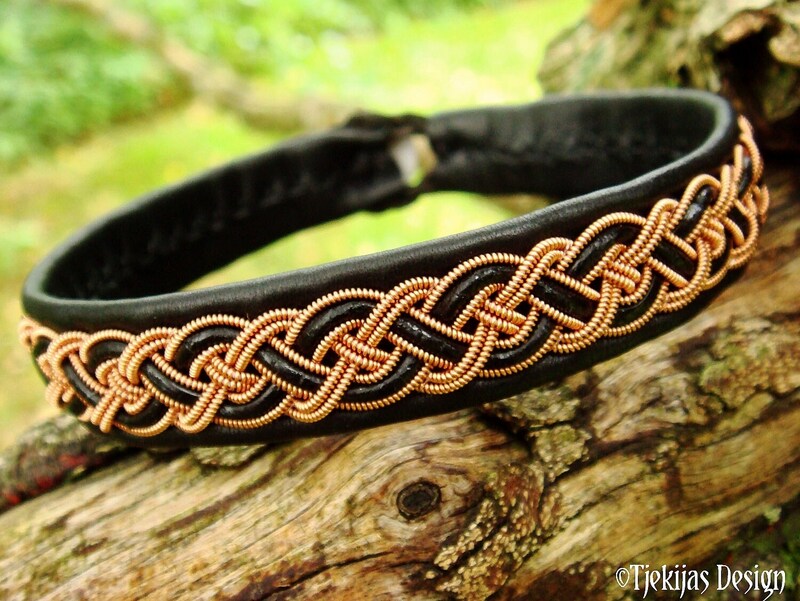 Copper braided with leather cord, and carefully hand sewn on vegetable tanned soft reindeer leather or lambskin. Completed with a carved reindeer antler closure. Width: approx. 1,4 cm (0,55"). Ships in a nice handmade gift box. Design: NIFLHEIM Copper - One of the Nine Worlds: The World of Fog, located under the roots of Yggdrasil, in Norse mythology. 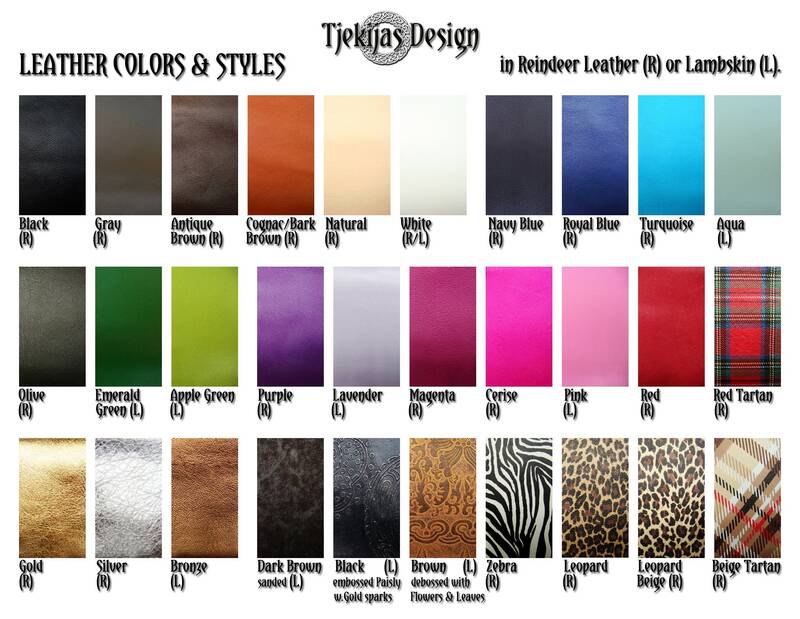 LEATHER COLORS AND STYLES: Please see last photo - 30 colors to choose from. SIZE: Please measure your wrist and add 1 cm (0,4"), for a perfect snug fit. The soft leather will stretch a little over time. PLEASE CHOOSE leather color and size from the drop down menu's. PLEASE ADD A NOTE with the leather cord color, you should like. 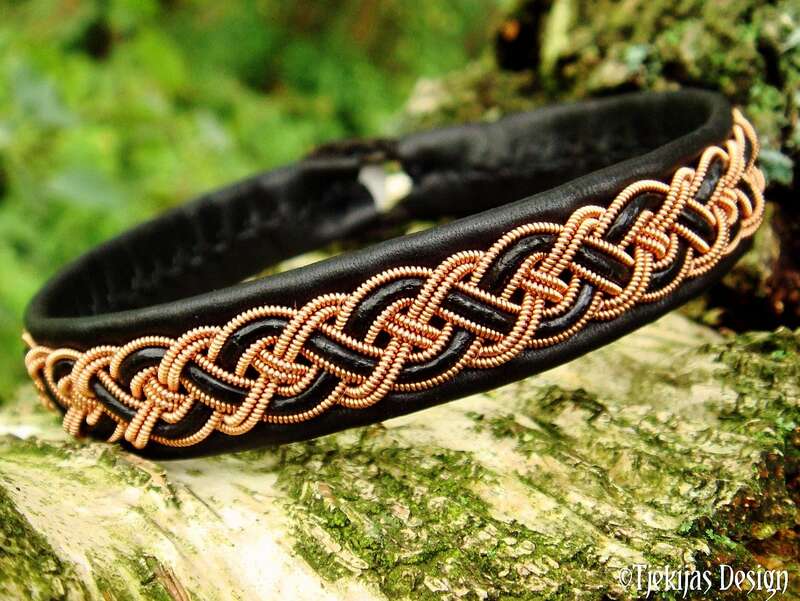 Your new Niflheim bracelet normally ships within 3-4 days from received order. 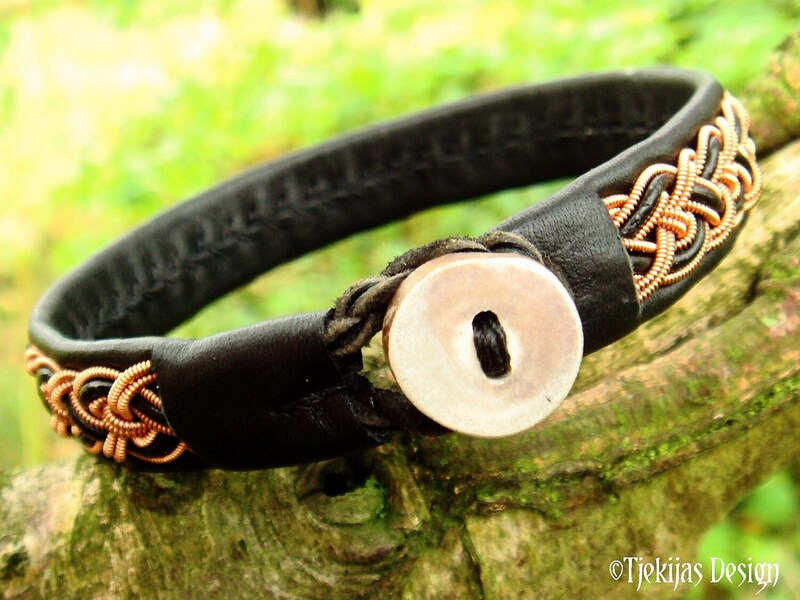 All my Sami Viking Bracelets, Necklaces, Earrings and Hair Clips are custom handmade to your order, with precision and care for detail. I use only authentic and best quality materials from Lapland in Northern Sweden. These beautiful pieces of handcrafted Leather Jewelry are originated from the fascinating ancient Northern Scandinavian folklore craft: 'Tenntraadsbroderi' or 'Tin Thread Embroidery', created by the native Sami culture, still living in Arctic Lapland. Viking Sami Jewelry requires no special care, but should be removed before showering and bathing. The spun wire braids will flatten a bit over time, and get a more polished look, which only will add a nice patina to your 'Piece of the North'. My Sami Jewelry is custom handmade to order and will be shipped within 3-4 days of received payment. All orders will be shipped by Danish Post 1. class airmail. Securely packed in a padded envelope, discretely without company-logo and manually adressed. Custom regulations and fees are the buyer´s responsibility. I do not accept returns or exchanges, shipped to me without my confirmation. I only refund or exchange items, that show no sign of use or having been worn.